The law, announced last week and due to come into force in September, says social media should only be used for "[exchanging] personal information". The US embassy in Hanoi said it was "deeply concerned" by the decree. Vietnam has convicted at least 46 activists, including bloggers, for anti-state activity this year. The law, known as Decree 72, bans the online publication of material that "opposes" the Vietnamese government or "harms national security". It also specifies that social networking sites such as Twitter and Facebook should only be used "to provide and exchange personal information". In a statement on Tuesday, the US embassy in Hanoi said it was "deeply concerned by the decree's provisions that appear to limit the types of information individuals can share via personal social media accounts and on websites". "Fundamental freedoms apply online just as they do offline," it said. Campaign group Reporters Without Borders, which has included Vietnam among its list of "Enemies of the Internet", said: "If [the decree] takes effect, Vietnamese will be permanently deprived of the independent and outspoken information that normally circulates in blogs and forums". 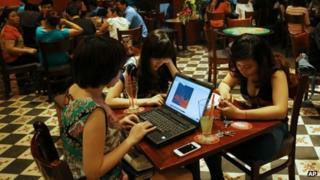 The law would also require foreign internet companies to keep a server inside Vietnam, news agency AP reported. The Asia Internet Coalition, an industry group that represents companies including Google and Facebook, said in a statement: "In the long term, the decree will stifle innovation and discourage businesses from operating in Vietnam." Vietnam is a one-party communist state and the authorities maintain a tight grip on the media.